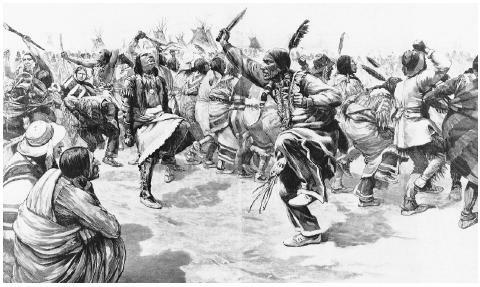 The Ghost Dance was the central rite of a messianic Native American religious movement in the late nineteenth century. It indirectly led to the massacre of some 250 Sioux Indians at Wounded Knee, South Dakota, in 1890, marking an end to the Indian wars. As a trance-enducing rite of a hybrid faith, it combined elements of Christianity with Native American religious traditions. The Ghost Dance first emerged around 1870 in the Walker Lake area on the California-Nevada border. A Paiute mystic named Wodziwob, or "Fish Lake Joe," began to preach an apocalyptic vision in which a great flood or fire would eliminate the white man from the world and deceased tribal people would return alive to the earth. Wodziwob's assistant, a shaman named Tavibo, spread the new doctrine among Nevada tribes. The original Ghost Dance fervor among far western American tribes gradually ebbed only to be rekindled in 1888 by Wovoka, Tavibo's son. The new prophet, also known as Jack Wilson, was said to practice miracles such as curing the sick, controlling the weather, and withstanding bullets shot at him. Wovoka claimed that while feverishly ill he saw in a vision all deceased Indians surrounding the throne of "the Great Spirit" God who told him to teach his people to love one another and to live peacefully with white people. Further, all deceased Indians would return to the earth and recover their ancestral lands. According to the vision, white men and women would retreat to their European homelands. The prophet taught his followers a five-day ritual of song and circle dances that would hasten the coming of this new millennium; hence, the Ghost Dance was born. This wood engraving from 1891 depicts a group of Sioux dancers performing, most likely, one of their last ghost dances before the arrest of the warrior chief Sitting Bull. herded by the United States military onto reservations, including the Arapaho, Bannock, Caddo, Cheyenne, Comanche, Kiowa, Sioux, Shoshones, and Utes. Each tribe adopted its own Ghost Dance songs and wore clothing painted with sacred symbols believed designed to ward off bullets. The Ghost Dance movement came to a tragic end on Sioux reservations in South Dakota during the winter of 1890–1891. Sitting Bull, the famous Hunkpapa Sioux warrior chief, had become an enthusiastic follower of the new faith, along with his people on the Standing Rock Reservation in South Dakota. Their new religious fervor alarmed white United States government agents on the reservation who decided to arrest the chief as a means of restoring peace to the reservation. On December 15 Sitting Bull was shot and killed during a skirmish when Native American agency police tried to arrest him. Some of Sitting Bull's followers escaped to the Cheyenne River Reservation to join Miniconjou Sioux who were also practicing the Ghost Dance under the leadership of Chief Big Foot. But on December 29, when American cavalry caught up with Big Foot's group encamped along Wounded Knee Creek and tried to disarm them, rifle shots on both sides broke out. The American military, armed with four Hotchkiss machine guns, massacred the Sioux warriors and their unarmed women and children. The massacre marked the ending of the Indian wars in the American West. Andrist, Ralph K. The Long Death: The Last Days of the Plains Indian. New York: Macmillan, 1964. Brown, Dee. Bury My Heart at Wounded Knee. New York: Henry Holt, 1991. Kavanagh, Thomas W. "Imaging and Imagining the Ghost Dance: James Mooney's Illustrations and Photographs, 1891–1893." In the Indiana University [web site]. Available from http://php.indiana.edu/~tkavanag/visual5.html . The illustration you have chosen to use is by a man named Aimidee Forrestier who worked for the London (UK) Illustrated News. He never saw a Ghost Dance.